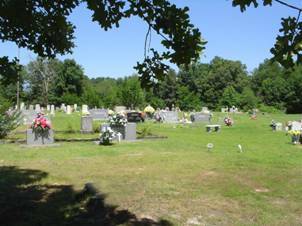 The Tabernacle Cemetery is in the Greenhill, Alabama community. To reach the cemetery, traveling east from Florence, AL, turn north onto US Highway 43. Travel to the Greenhill community, turning right onto County Road 47. Travel approximately .9 mile and the cemetery and church are on the left at the intersection of County Rd. 47 & County Rd. 140. This enumeration is to the memory of William Lindsey “Bill” McDonald who passed from this life on June 20, 2009. I talked with Bill on the phone several times and talked with him at the Florence/Lauderdale Public Library in Florence, Alabama. As has been said, he was very knowledgeable about the Shoals area history and loved to talk about it. One could sit and talk with Bill for hours about the local history. Bill asked me several months ago to enumerate the Tabernacle Cemetery at Greenhill and pass a printed copy to him. Regretfully, I never accomplished that during his better days of life. So, this is a tribute to him, a soft spoken, kind and gentle man who will be missed very, very much. 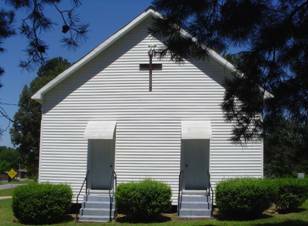 Click “Here” to go to the rootsweb page, scroll down the page and read about the history of the church & cemetery. Angel, Lizzie; b. 26 Dec 1872, d. 12 Sep 1878, daughter of J.M. & S.A.
Angel, Willie; b. 20 Sep 1853, d. 09 Mar 1878, son of W.M. & M.
Black, Evelyn; b. 31 Aug 1918, d. 10 Apr 1934, daughter of M.H. & M.V. Bretherick, James W.; b. 03 Oct 1862, d. 21 Oct 1862, child of J. & M.J.
Bretherick, Robert D.; b. 14 Dec 1873, d. 12 Jan 1890, son of Jas & M.C. Bretherick, William D.; b. 04 Aug 1861, d. 30 Aug 1861, child of J. & M.J.
Butler, Lucy; b. 01 Mar 1854, d. 23 Aug 1923, wife of John H.
Cauhorn, Mary H.; b. 13 Dec 1846, d. 16 Mar 1921, wife of William W.
Hill, David Lewis; b. 03 May 1869, d. 04 Dec 1875, son of Rev. H.R. & M.E. Hill, Dora Irene; b. 26 Feb 1896, d. 14 Jan 1913, daughter of H.T. & Sarah E.
Hill, Mary Bessie; b. 11 Mar 1905, d. 09 Dec 1913, daughter of H.T. & Sarah E.
Hill, Rosaner A.; b. 14 Sep 1836, d. 13 Jan 1909, wife of C.S. LeMaster, Mary L.; b. 21 Jan 1801, d. 14 Mar 1872, wife of Capt. Jno W.
LeMaster, Sophronia A.; b. 05 Aug 1827, d. 07 Jan 1879, daughter of Capt. J.W. & N.L. Myrick, Sarah; b. 15 Aug 1827, d. 26 Jun 1855, wife of Jas C.
Nicholson, Mattie J.; b. 10 Dec 1851, d. 06 Dec 1930, wife of William H.
Robinson, Margret (Cauhorn); b. 26 Nov 1866, d. 29 Jan 1916, wife of Thomas I.
Swinea, Sarah Ellin; b. 09 Mar 1862, d. 15 Nov 1915, wife of F.J.